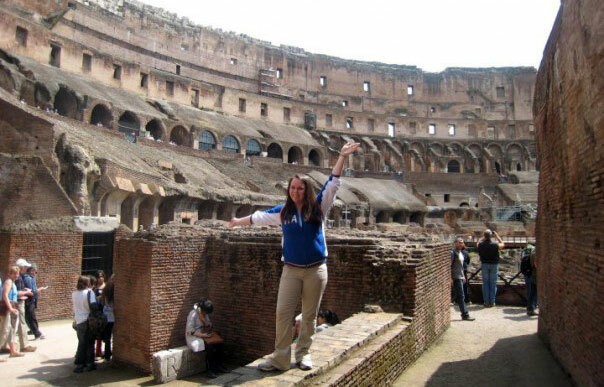 Alissa Evans, a junior in the psychology program, wasn’t sure what to expect when she decided to enroll in May Term and travel to Florence, Naples and Rome for six days in 2011 with a group of adventurous AU students. Little did she know she would return with a global appreciation of the world and a sense of connection to her heritage. By enrolling in May Term, which offers AU students the opportunity to take three-week travel-study courses, everything Evans studied in class came to life as she walked the street’s of Italy, met its people and visited its churches and monuments. We asked Evans about her May Term experience and why other AU students should take advantage of the opportunity to see the world. Why did you decide to enroll in May Term? I wanted the experience of exploring a foreign country while taking a class that was geared toward my major. Where did you go for May Term? I went to Italy (Rome, Florence and Naples) with faculty members David Rudek and Anna Spinos-Rudek for the May Term course From Cradle to Colosseum: A Study of Human Emotion. We were in Italy a little over a week and spent four days before our trip and four days after taking classes on campus. How did you spend your time during your trip? Our days were full. We would wake up early, visit several historic sites (Colosseum, Forum, Duomo and Vatican), museums (Galleria Borghese and Uffizi) and locations (Piazza Navona, Florence and Naples) during the day. We would have dinner together as a group, and then our nights were free for us to explore the cities independently. It was a nice balance of having a structured schedule for sight-seeing and then free time to explore. What is your favorite memory from May Term? My favorite memory was standing in the Colosseum. You could feel the history surrounding you. It is so hard to fathom the grandeur of the Colosseum — just how big and how old it is until you’re standing right there. The experience really but things in perspective in terms of what I thought I knew and how little I really did know. It was absolutely life changing and powerful. What was the biggest take away you had from your trip? I felt an enormous connection to my roots, as my family is Italian. I could sense my heritage as soon as we got off the plane. The other major take-away for me was just how much there is to discover in the world and culture to experience. It really opened my eyes. It also sparked my passion for traveling. Since this trip, I have actually returned to Italy, as well as traveling to the Bahamas, Spain, Croatia, Montenegro, Greece, Bulgaria, Turkey and Morocco. This summer, I am spending six weeks volunteering in the Philippines, traveling through Asia for about a month beforehand (Japan, China, Hong Kong, Thailand, Vietnam and Malaysia). The value of May Term is infinite. Nothing can compare to experiencing life in another country. There is so much out there that we can’t even imagine without leaving the United States to experience it. May Term is especially beneficial because you earn academic credits while traveling.